Orders by non-business customers will require an EPP license. More details here. There are two varieties of Potassium Perchlorate available, high purity and free flowing grades are both stocked. 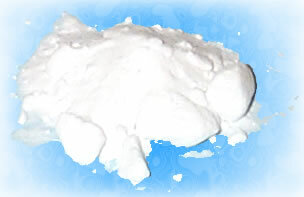 The high purity grade is 99.8% pure Potassium Perchlorate and is a very fine white powder that will have clumped into varying sized blocks that can be broken apart easily with a pestle and mortar, or similar tools. The free flowing grade is a joy to work with, 0.5% addition of fumed silica gives the powder a smooth, fine texture that is free from clumps and is ready to mix with other powders without the need for grinding. The small fraction of fumed silica is quite inert and will not disrupt the oxidising power of the Potassium Perchlorate. These grades of potassium perchlorate have been manufactured with very low levels of chlorate impurities. Photo is of the high purity grade. May cause fire or explosion; strong oxidiser. Harmful if swallowed. Prevention: Keep away from heat. — No smoking. Keep away from combustible materials. Take any precaution to avoid mixing with combustibles. Wear protective clothing. Wear fire retardant clothing. Wash hands thoroughly after handling. Do no eat, drink or smoke when using this product. Response: IF ON CLOTHING: rinse immediately contaminated clothing and skin with plenty of water before removing clothes. In case of major fire and large quantities: Evacuate area. Fight fire remotely due to the risk of explosion. In case of fire: Use foam, water, CO2 or powder for extinction. IF SWALLOWED: Call a POISON CENTER or doctor if you feel unwell. Rinse mouth.